There’s a whole lot a of hype going on for L.A. Rising and it’s rightfully so. 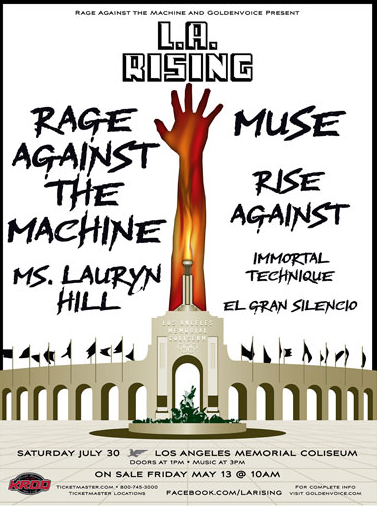 The massive concert will feature Rage Against The Machine, Muse, Lauryn Hill, Immortal Technique and El Gran Silencio all at the L.A. Coliseum on Saturday, July 30, 2011. Tickets to the show come at a hefty price of $99 & $69 (plus applicable fees). We know times are tough and it ain’t easy going to massive gigs these days. Thanks to our friends at Goldenvoice, we have some tickets to give away! Take a stab at winning a pair of L.A. Rising concert tickets in our contest below. You must have a Twitter or Facebook to enter the contest. First make sure you’re following Grimy Goods on Twitter here and/or “like” our Facebook page here. We’ll pick winners at random on Thursday night, June 9. The winners will be direct messaged on Twitter or contacted below their contest entry comment on the Grimy Goods Facebook page. Winners will have until noon Friday, June 10 to claim their win or the tickets will be forfeited. To increase your chances, enter the contest both ways! Via Twitter: Tweet us a message! Be sure to send your Tweet to @GrimyGoods and to use the following hashtag in your Tweet: #ContestLARising. Also, be sure to mention @LA_Rising. These are some coveted tickets we’re giving away so make your tweet count and stand a part from the rest. We like clever, funny, creative and witty Tweeters! Via Facebook: Leave a comment on the Grimy Goods Facebook page telling us why we should hook you up with these tickets! Be sure to mention L.A. Rising so we know which contest you’re entering! These are some coveted tickets we’re giving away so make your comment count and stand apart from the rest. We like clever, funny, creative and witty comments. For more cool shows coming up through Goldenvoice, click here. To enter other Grimy Goods contests, click here. This entry was posted in Giveaways and tagged concerts, contest, El Gran Silencio, events, free, giveaway, Immortal Technique, indie, l.a. coliseum, Lauryn Hill, los angeles coliseum, Muse, presales, Rage Against the Machine, Rise Against, Shows, sweepstakes, ticket giveaway on June 6, 2011 by Sandra Burciaga Olinger.